Jignesh Mewani said that the quota system was introduced in the country to give representation to socially and educationally backward people. 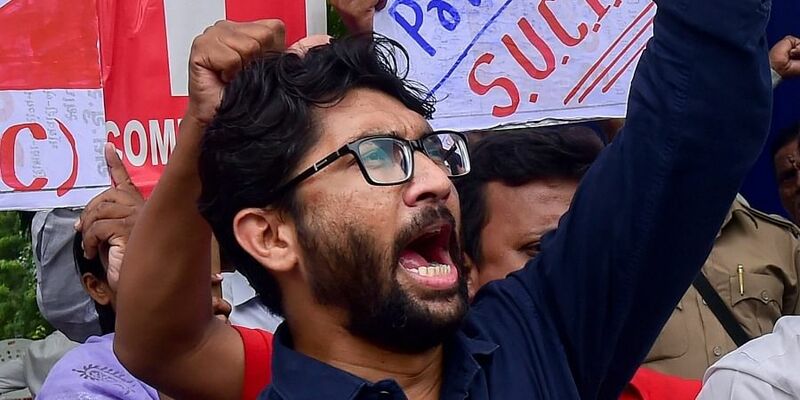 KOLKATA: Gujarat independent MLA and Dalit leader Jignesh Mewani said Sunday that the Centre's move to provide 10 per cent quota to upper caste poor is a step towards realizing the RSS-BJP's agenda to remove caste-based reservations from the system. President Ram Nath Kovind Saturday gave his assent to the constitutional provision to provide 10-per cent reservation in government jobs and education to economically backward section in the general category. The bill was passed by the Parliament on January 9. "I am apprehensive and so are the members of the Scheduled Caste/ Scheduled Tribe and Other Backward Class that this is the first step towards putting an end to the reservation on the ground of socio-educational deprivation. "It has been a long-pending agenda of the RSS-BJP to discard the Constitution and end reservation based on caste system," Mewani said on the sidelines of a programme here. The Independent MLA also said that the quota system was introduced in the country to give representation to socially and educationally backward people, it wasn't meant to end poverty. "We have absolutely no issues with the poor people from the other communities getting any benefit. But reservation is not meant to remove poverty. "It is meant to give representation to SC/ST/OBC people, who on account of the society's caste structure, have remained socially and educationally backward," he said. Congratulating BSP supremo Mayawati and SP supremo Akhilesh Yadav for stitching an alliance in Uttar Pradesh against the BJP, Mewani said the other opposition parties should also take cue from the coalition and make efforts for maximum polarisation of anti-BJP votes.